Lockinfo White Text is a mod that changes the font color and style for LockInfo (a feature-packed lock screen mod). Normally, on LockInfo, the title font is white and the rest of the text is gray. This mod changes all the text to white and italicizes the title font to help differentiate between the title and the rest of the text. This mod would come in handy if you have a lock screen background that makes it difficult to read the gray text. Overall the mod worked exactly how I expected it to. I was able to activate and deactivate it without a problem. 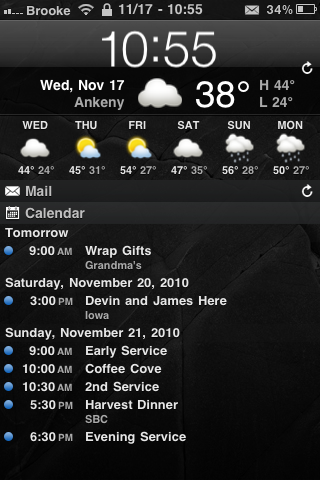 The mod can be activated/deactivated using WinterBoard and is available via the BigBoss source. Check out the screenshots below. No offense to the designer on this one but this is not for me. This is a full leather theme. not just a lockscreen and springboard with icons. If you are looking for leather, this is the one. There are 4 colors to choose from, each it’s own install. I like the black the best. Each color is $1.49. Dress your iPhone up in Brown Leather A spectacular theme for your iPhone that will make it look elegant, expensive and attractive! Brown leather, Brown icons, Battery, SMS, Clock, Notes, UI icons, Calculator, Dialer, Dialer icons, Bottom and Top bars!!! and that\’s not all – the theme comes with a special template PSD icon for making your own exclusive theme Design your own icons in no time – all in the same price!!! What are you waiting for?, Brown it NOW! This theme is copyrighted by Peach-i. New Poll – What color iPhone 3G will you get? Time for a new poll! The last poll was – What is your preferred method of Jailbreaking version 1.1.4? Below are the results based on when we added the poll one week ago. What color iPhone 3G willl you get?